In an effort to promote healthy living in Orange County, Mayor Teresa Jacobs recently held the 2014 Mayor’s Health Summit, which offered citizens free health screenings and information sessions at the Renaissance Senior Center in East Orange County. In addition to offering access to blood pressure and lipid checks, Body Mass Index readings (BMI) and developmental screenings, the Health Summit offered detailed information sessions on diabetes, colon, breast and cervical cancer. Attendees also interacted with health care professionals and gained information on how to support a healthier lifestyle from partner agencies like the University of Florida Cooperative Extension, which offered healthy cooking demonstrations. Citizens had the opportunity to visit Florida Hospital’s mobile mammography unit while Orlando Health representatives assisted residents with vital health screenings. Additionally, Lake Nona’s Nemours Children’s Hospital offered citizens child developmental screenings. 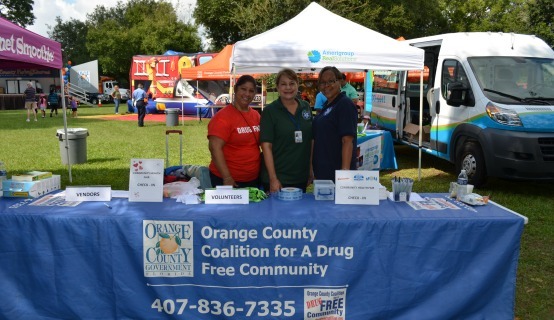 Norma Asencio, chair of Orange County’s Minority Outreach and Elder Ambassador Committee, spent the day assisting several Hispanic constituents at the Health Summit. Several health partners who attended the Health Summit said wellness and healthy living has become a priority for residents in Central Florida. A collection of photos from the Health Summit are available on Flickr for use by the media.